§ On behalf of the CDF Collaboration. We present results on central exclusive production of π+π- in pp collisions at s=900 and 1960 GeV using events with two charged hadrons in the final state within the pseudorapidity region |η |≤ 1.3 and no particles in |η| > 1.3. These results open a new window into hadron spectroscopy, and may be used as benchmarks for testing relevant theoretical models. The CDF Collaboration (CDF) has been studying diffraction in pp collisions for the past quarter century, aiming to understand the QCD aspects of the diffractive exchange, a strongly interacting color-singlet quark/gluon combination with vacuum quantum numbers, traditionally referred to as Pomeron (IP) exchange. 1 Such exchanges lead to large, non-exponentially suppressed pseudorapidity regions devoid of particles, called rapidity 2 gaps. Diffractive processes are classified as single dissociation or single diffraction, SD, characterized by a forward gap adjacent to a surviving p, or p double dissociation or double diffraction, DD, characterized by a central gap, and central diffraction or double-Pomeron exchange (CD or DPE), a process with two forward gaps. A special class of diffraction is central exclusive production, a DPE process in which a specific state is centrally produced . CDF has published results on exclusive dijet (2008) , µ+;µ- (ZcJ/Ψ and J/Ψ, and (2009) , and γγ / e+e− and /(2012)  production In this paper, we report on the observation of exclusive π+π/- production  and compare our results with theoretical expectations. Detector. The CDF II detector is shown schematically in Fig (1). It consists of the main detector, labeled CDF II in this figure, equipped with a tracking system and calorimeters (central: CCAL, plug: PCAL), and the forward components (Cherenkov Luminosity Counters: CLC, MiniPlugs: MP, Roman Pot Spectrometer: RPS). The RPS and MP were not active in this study, and from the BSC only those covering the pseudorapidity region of 5.4<<5.9 are used. zero-bias: offline selected bunch-crossing events with no tracks, for use in noise/exclusivity studies. Datasets. The signal datasets consist of 90(22) ˟1010 events at s=1960900 GeV. We report results for events with exactly two tracks within rapidity y+<1.0 and M+<0.8 where there is useful acceptance at all pt. No particle ID is (yet) being used, and the observed tracks are assumed to be due to pions. We select events in regions of instantaneous luminosity 1˟1030 <L< 2.2 ˟1030 cm–2s–2 (Fig. 2-left), and set detector thresholds for optimum signal/noise ratio (Fig. 2-right). Zero-bias data sample at s =1960 GeV with an exponential fit: (left) efficiency of event selection (probability that the whole detector is empty) vs beam-bunch instantaneous luminosity for a single bunch (the L quoted in the text is 36 times larger, as there are 36 colliding bunches); (right) detector-noise levels for “interaction” and “no-intezoomraction” events. The vertical dashed lines show the cuts used to define “empty” detectors or “noise” (the K+K-K background in this area, measured with K0K0 events, amounts to a few %). Fig. (3) shows mass distributions π+π- of candidate events uncorrected (left) and corrected (right) for acceptance. The f0 (980), f2 (1270), and (1370)f0 are clearly visible. The small but significant peak at 3.1 GeV is understood to be from j/ψ→ e+e- with e+e- treated as. M π+π- The integrated cross section over the region 0<π+π-<5 GeV and y+<1.0 at s=1960 GeV [900 GeV] is 1910 ± 4 (stat.) ± 380 (syst.) [825 ±11(stat) ±s160 (syst)] nb. The higher cross section at s=1960 GeV may be due to the ηmax = 5.9 same cut at both energies, while the proton beam rapidity is ybeam=Insmp=7.87, allowing higher Mπ+π/- values at 1960 GeV. Mπ+π/- distributions at s =1960 GeV not corrected (left) and corrected (right) for acceptance. Fig. (4) shows the ratio Mπ+π/- of candidates 6=1960600 at GeV (top), and the mean pt for 6=1960 GeV (bottom-left) and 6=900 GeV (bottom-right) Mπ+π−vs . 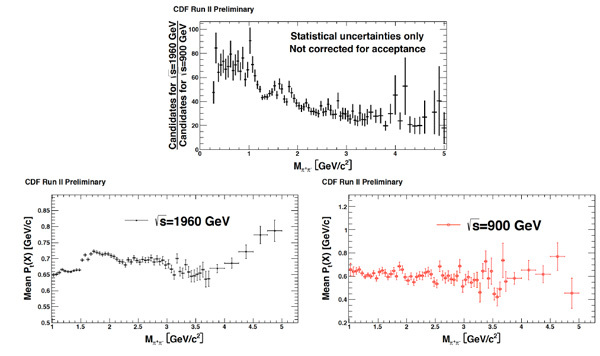 The statistically more significant data at 6=1960 GeV show structures at 1.5 GeV, 2.25 GeV, and between 3 GeV and 4 GeV. Work is in progress to understand these structures, including a phase-shift analysis. Ratio of events at s =1960 / 900 GeV (top), and mean pt of π+π/- (left/right) vs MMπ+π−. In Fig. (5), we compare the distributions of dσ/ d Mπ+π− events at 6=1960 and 900 GeV for M π+π− < 5 GeV (left), and zoom into the region of M π+π− < 2 GeV (right) for an expanded view. At GeV, we observe features in the mass spectrum which are not yet understood and are the subject of further ongoing studies. Differential cross sections dσ/ d Mπ+π− vs M π+π− at s =1960 and 900 GeV for π+π− < 5 Mπ+π− < 1.5 GeV (left) and Mπ+π- < 2 GeV (right). We have measured exclusive π+π− production in pp collisions at 6=900 GeV and 6=1960 GeV with the CDF II detector at the Fermilab Tevatron Collider. Using tracks, assumed to be from pions, which are the dominant charged-pair component, we explored the low mass region of π+π− < 5 GeV. We observe the well known resonances f0 (980) and f2 (1270), and see a small but significant peak at 3.1 GeV understood to be from j/ψ→ e+e- with M e+e- assumed as M π+π- We also observe features at M π+π- > 1.5 GeV, which are not yet understood. Further investigations of these features, including a partial wave analysis, are currently underway. 1Recent CDF results on diffraction have been presented in DIFFRACTION 2012 ; in the present paper we concentrate on exclusive π+π- production, closely following the CDF presentation in EDS-2013 . and pseudorapidity, η = −lntan /θ2, where θ is the polar angle of a particle w.r.t. the proton beam (+Z), are approximately equal for particles detected in the calorimeters. I would like to thank my colleagues at the CDF Collaboration who made this work possible, and the Office of Science of the Department of Energy for financial support. Goulianos K. Diffractive dijet production at CDF, in proceedings of DIFFRACTION 2012: International Workshop on Diffraction in High Energy Physics. 1523 In: Puerto del Carmen, Lanzarote, AIP Conf Proc; September; 2012; pp. : 298-301. Goulianos K. New results on diffractive and exclusive production from CDF to appear in proceedings of XXI international workshop on deep-inelastic scattering and related subjects. April, 2013; Marseilles, France. 2013. Albrow MG, Coughlin TD, Forshaw Jr. Central exclusive particle production at high energy hadron colliders. Prog Part Nucl Phys 2010; 65: 149. Aaltonen T, Adelman J, Akimoto T, et al. (CDF Collaboration) Observation of Exclusive Dijet Production at the Fermilab Tevatron pp Collider Phys Rev D 2008; 77: 052004. Aaltonen T, Adelman J, Akimoto T, et al. (CDF collaboration) Observation of exclusive charmonium production and γγ→µ+µ- in pp collisions at s TeV Phys Rev Lett 2009; 102: 242001. Aaltonen T, Albrow MG, Gonz´alez BA, et al. (CDF collaboration) Observation of exclusive ?? production in pp collisions at s = 1.96 TeV. Phys Rev Lett 2012; 108: 081801. Albrow MG. (Representing the CDF collaboration) Central exclusive production of hadrons in CDF, in proceedings of DIFFRACTION 2012 International Workshop on Diffraction in High Energy Physics; September. 2012 AIP Conf Proc 2013; 1523: 294.